Is this person ill or just old? This question reflects the pondering mind of a doctor while interpreting the complaints of an elderly person who seeks his help. Many doctors think that ageing is a non-disease. Accordingly, various attempts have been undertaken to separate pathological ageing from normal ageing. However, the existence of a normal ageing process distinct from the pathological processes causing disease later in life can be questioned. Ageing is the accumulation of damage to somatic cells, leading to cellular dysfunction, and culminates in organ dysfunction and an increased vulnerability to death. Analogously, chronic diseases initiate early in life and their development is slow before they become clinically apparent and culminate in disability or death. The definition of disease is also subject to current opinions and scientific understanding and usually, it is an act of individual creativity when physical changes are recognised as symptoms of a new disease. New diseases, however, are only rarely really new. Most new diseases have gone undiagnosed because their signs and symptoms escaped recognition or were interpreted otherwise. Many physical changes in the elderly that are not yet recognised as a disease are thus ascribed to normal ageing. Therefore, the distinction between normal ageing and disease late in life seems in large part arbitrary. We think that normal ageing cannot be separated from pathological processes causing disease later in life, and we propose that the distinction is avoided. Is this person ill or just old? This question reflects the pondering mind of a doctor while interpreting the complaints of an elderly person who seeks his help. Should the complaints be explained by the normal ageing process or is there a disease as yet undiagnosed? Many attempts have been undertaken to separate pathological ageing from normal ageing. The distinction, however, has remained unclear as it appears to be dependent on current opinions and the extent of our scientific understanding . Isolated systolic hypertension, for example, has long been considered normal in elderly people. Today, it is recognised as an outcome of atherosclerosis and a principal cause of cardiovascular disorders that necessitates proper treatment, also in the very old . Furthermore, it is confusing that the description of normal ageing as a series of cumulative, universal, intrinsic and deleterious changes , also applies to many chronic diseases . The aim of the present paper is to explore the relation between ageing and disease late in life. To that end, we provide the biological definition of ageing, comment on the definition of disease, and present a conceptual framework of the ageing process that can be applied in clinical medicine. This framework can help doctors in understanding the physical changes that they observe in elderly patients without having to decide whether their patient is ill or just old. Ageing is defined as those processes in an organism that increase the mortality risk as a function of time . This definition seems rather simplistic and it looks as if all key parameters of ageing are ignored by it. However, the reverse is true. Imagine that the mortality risk does not increase with age. In that case, living cautiously and avoiding accidents would imply eternal life. However, death is a fact of life and over the years the mortality risk inevitably increases despite all our efforts to prevent it. The biological process that underlies ageing is an accumulation of damage to somatic cells (figure 1) . Several intrinsic and extrinsic stressors may lead to injuries of the body. Well-known examples are the free oxygen radicals produced by the oxidative metabolism and infections that emerge from the environment. Although most of the injury is repaired, the repair is often not complete because of the high metabolic costs associated with it . High metabolic costs reduce the resources available for other essential functions of the organism, such as reproductive capacity . From an evolutionary point of view, a species' best survival strategy is to limit the investment of resources in the repair of injuries to the amount that is necessary to produce offspring. Therefore, the somatic maintenance of the body is not complete, and, as a consequence, there is permanent damage. The biological mechanism underlying ageing The quadrangle (A) represents the human body. Extrinsic and intrinsic stressors cause injury (B). Subsequently, several mechanisms repair the injury, but the repair is not complete because of its high metabolic costs (C). As a consequence, damage accumulates (D-G), and cells, tissues, and organs decline in function. Defining disease is difficult. New diseases continually arise . Usually, it is an act of individual creativity when certain physical changes are recognised as symptoms of a new disease. A disease is more easily accepted as such when it has therapeutic consequences. New diseases, however, are only rarely really new. Most new diseases have gone undiagnosed because their signs and symptoms escaped recognition or were interpreted otherwise. Many physical changes in the elderly that are not yet recognised as a disease are thus ascribed to normal ageing. In the past, this has not only happened to isolated systolic hypertension but also, for example, to osteoporosis. Therefore, the distinction between normal ageing and disease late in life seems in large part arbitrary . From an epidemiological point of view, diseases can best be explained by the accumulation of component causes. Component causes are part of a conceptual framework that originally has been developed by Rothman . A sufficient cause is defined as an event or a state of nature that initiates or permits a sequence of events that inevitably results in an effect . However, most causes with medical relevance are not sufficient in themselves but components of a sufficient cause (figure 2). A component cause thus reflects what is generally called a risk factor. An effect occurs according to the principle that a specific combination of component causes must be present to complete a sufficient cause. The distinction between component causes and sufficient causes Sufficient causes I and II have five component causes each and sufficient cause III has seven component causes. The component causes are depicted as A to J. All three sufficient causes share the component causes A and B, that can be interpreted as shared risk factors if the sufficient causes have distinct effects (adapted from Rothman, 1976 ). An effect, or a disease, can be explained by different combinations of component causes (figure 2). Each combination constitutes another sufficient cause. Sufficient causes that have the same effect may share some of their component causes. On the other hand, some component causes may be part of different sufficient causes, each having its own distinct effect. In medicine, this phenomenon is recognised as different diseases sharing the same risk factors. For example, smoking is not only a component cause of atherosclerosis, it is also a component cause of lung cancer. The specific combination with other component causes determines which effect becomes clinically apparent. At a certain point, some of the necessary component causes to complete a sufficient cause may be missing . However, the missing component causes can be accrued over time. It is this gradual accumulation of component causes that provides a model to understand the physical changes that occur with ageing. The more component causes accumulate throughout a lifetime, the more sufficient causes will be completed. As a consequence, the number of physical changes grows with increasing age (figure 3). Depending on our scientific insights, some of these changes are interpreted as a disease whereas others are interpreted as normal ageing. Conceptual scheme of ageing as the accumulation of component causes throughout life Ageing starts with the accumulation of component causes A–E. The presence of these five component causes completes sufficient cause I, resulting in effect I, e.g. unsteadiness. In the following period, the addition of component causes F–H completes sufficient cause II, resulting in effect II, e.g. a gait disorder. The further accumulation of component causes I and J completes sufficient cause III, resulting in effect III, e.g. death (see also the description of the example). Death can be explained by a line of reasoning similar to the one that has been put forward here to explain the physical changes with ageing (figure 3). Death has several sufficient causes. Since their origin is complex, most sufficient causes of death are likely to consist of a large number of component causes. At puberty, when the mortality risk is lowest, there are only a few component causes. As we grow older, the sufficient causes that constitute the various causes of death are step by step completed. Every new component cause increases the chance of completing one of the sufficient causes. The model thus explains the increased mortality risk in old age, the hallmark of ageing . Unsteadiness is a common complaint in elderly people, and, in most cases, it cannot be ascribed to one factor. Therefore, let us suppose that someone has accumulated the following component causes (illustrated in figure 3): A, a stooped posture; B, polyneuropathy; C, high-heeled shoes; D, an impaired vision; and E, a clavus under the sole of the foot. Let us also suppose that these five factors are sufficient to cause a feeling of unsteadiness. Then, it becomes clear why the purchase of other footwear, the acquirement of new glasses or the removal of the clavus is sufficient for the complaints to disappear. The cause becomes insufficient. Subsequently, the patient may have accumulated the following new component causes: F, isolated systolic hypertension; G, periventricular white matter lesions; and H, global atrophy of the brain. 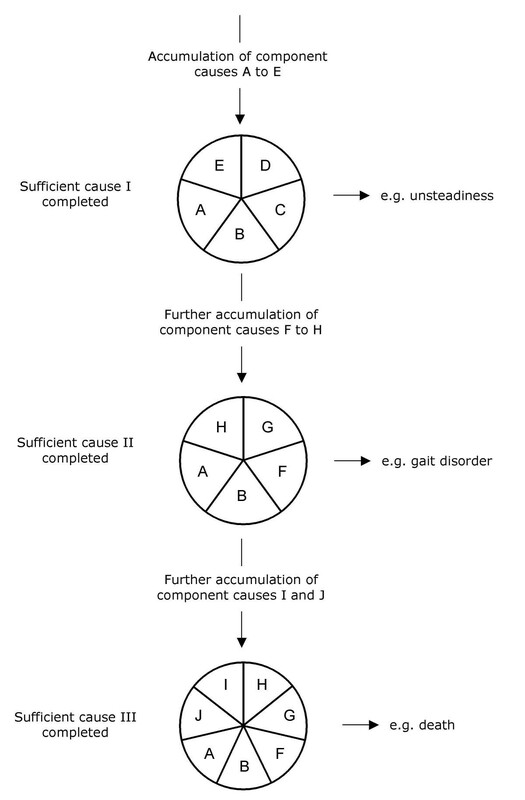 In combination with factors A and B, the factors F, G and H complete a sufficient cause of an abnormal gait. Some doctors may diagnose a disease, for example, small vessel disease due to hypertension. Others may interpret the gait disturbance as an often occurring, normal phenomenon in elderly people, and thus call it a senile gait disorder. However, irrespective of the interpretation of their cause, all gait disorders in elderly people are associated with an increased mortality risk and should therefore be interpreted as abnormal . One day, our patient takes a fall (I) and develops a subdural haematoma (J). The accumulation of these two component causes completes a sufficient cause of death, and the patient expires. The above example is an illustration of the accumulation of component causes being an explanation for the occurrence of physical changes, diseases and the increase in mortality risk in elderly people. In addition, the conceptual framework makes clear why some elderly people can be considered to be frail. Frail people may function independently when feeling well, but are at high risk of becoming dependent [11, 12]. Since many physiological functions decline with increasing age, they have a reduced reserve capacity. One single factor is then sufficient to cause a cascade of events leading to the deterioration of many body functions, and eventually death. In the conceptual model, this corresponds to the situation in which several nearly completed sufficient causes share a missing component cause. A single component cause may complete a series of sufficient causes and will set off several effects. As a consequence, a number of diseases become clinically apparent at the same time if only one new factor (component cause) is added. The presented conceptual framework is an explicit formulation of two common ideas about ageing. First, there is consensus of ageing being associated with the accumulation of damage . Second, it has been recognised that chronic diseases initiate early in life and that their development is slow before they become clinically apparent and culminate in disability or death . Both ideas, however, are consistent with the accumulation of component causes, physical changes, and diseases later in life as has been described in the conceptual framework. As such this framework has major implications for the interpretation of physical changes in elderly people. Many doctors think that ageing is a non-disease . Major textbooks on geriatric medicine and gerontology explain the occurrence of physical changes in elderly people as due to normal ageing or disease [15, 16]. The presented conceptual framework makes it clear that a similar process is causing ageing and disease in the latter part of life. Therefore, in our opinion, normal ageing cannot be separated from pathological processes causing disease later in life. As a consequence, we think that making a distinction between normal ageing and pathological ageing should be avoided. According to the same reasoning, it is not appropriate to use old-age-specific normal values. The decision whether a body function of an elderly patient is impaired or not must be based on the same normal values that are used in young adults. In fact, this idea is not new. Osteoporosis is defined relative to the average bone mineral density in young adults . This logic is not yet applied in all fields of medicine. For example, some authors propose lower normal values for haemoglobin levels in elderly people . In elderly people, however, all haemoglobin levels below the normal values in young adults are associated with excess mortality and must thus be considered as abnormal . In the same line of reasoning, we argue that the definition of normal values for cognitive and pulmonary function in the elderly has led to problematic concepts as late-life forgetfulness and senile lung [20, 21]. These concepts are used to explain an impaired cognitive or pulmonary function in the elderly without referring to disease. In our opinion, this is illogical. There is no good reason why the normal values for functions in young adults are not applied in adults at all ages. Finally, the presented conceptual framework is in line with the observation that frailty is more a constellation of many conditions than a discrete clinical entity . Accordingly, frailty is depending on the abundant presence of other risk factors, not on specific risk factors. Therefore, we think that it is erroneous to investigate the specific risk factors of frailty. With the purpose of preventing frailty in elderly people, we should investigate the risk factors (component causes) of diseases in the latter part of life. The existence of a normal ageing process distinct from the pathological processes causing disease later in life can be questioned. Ageing is the accumulation of damage to somatic cells, leading to cellular dysfunction, and culminates in organ dysfunction and an increased vulnerability to death. In addition, the definition of disease is subject to current opinions and scientific understanding. Based on the above, normal ageing cannot be separated from pathological processes causing disease later in life, and we therefore propose that the distinction is avoided. Avoiding the distinction between normal and pathological ageing has important implications for the clinician. For example, the use of old-age-specific normal values appears to be inappropriate. Gerbrand J Izaks and Rudi GJ Westendorp contributed equally to this work. GI discussed core ideas and drafted the manuscript. RW discussed core ideas and drafted the manuscript. Both authors read and approved the final manuscript.